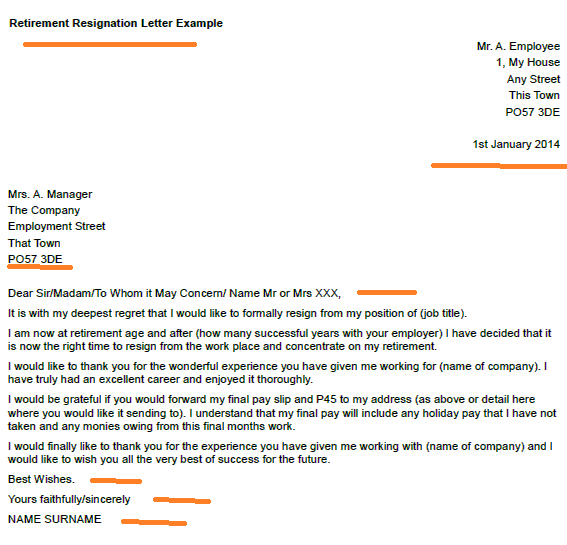 If you have got to that time in life when you are looking to retire and you need to formally resign from your current role then you want your resignation letter to sound nice and be grateful for your employment and be sorry to see your time come to an end. You will still need to stick to your basic employment rights and serve the notice period you have in your contract of employment so depending on how long you have been with your employer this could be up to 12 weeks notice so plan this in carefully. 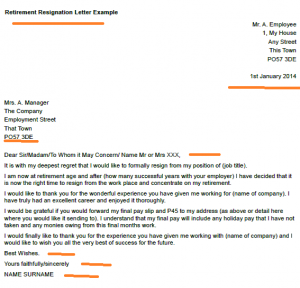 If you do have a long notice period and you would rather not serve all of it then speaking to your employer first before putting it in writing might be advisable as they may be able to negotiate your terms. It is with my deepest regret that I would like to formally resign from my position of (job title). I am now at retirement age and after (how many successful years with your employer) I have decided that it is now the right time to resign from the work place and concentrate on my retirement. I would like to thank you for the wonderful experience you have given me working for (name of company). I have truly had an excellent career and enjoyed it thoroughly. I would be grateful if you would forward my final pay slip and P45 to my address (as above or detail here where you would like it sending to). I understand that my final pay will include any holiday pay that I have not taken and any monies owing from this final months work. I would finally like to thank you for the experience you have given me working with (name of company) and I would like to wish you all the very best of success for the future.